The White House has announced the line-up of talent for Monday's White House Easter Egg Roll and it includes several tween stars. Actress and singer Rachel Crow is scheduled to sing the national anthem to kick the festivities off. And teen stars Janelle Monae, Cody Simpson, Rachel Crow, Zendaya, China Ann McClain and the McClain Sisters will also be performing on stage on the South Lawn. Among the other activities planned are a tennis clinic with former teenage tennis stars Michael Chang and Chris Evert and the "Eggtivity Zone" which will feature professional athletes such as Dedreck Etan Thom and Nick Young of the NBA and the NFL's Brian Orakpo, Lorenzo Alexander, and Antwaan Randle El. The star of NBC's "Biggest Loser", trainer Bob Harper, will also be part of the activities which are a part of First Lady Michelle Obama's "Let's Move" initiative. Several stars like ABC's Robin Roberts, actress Julianne Moore, and actor Forest Whitaker will be reading stories to children. And White House chefs will be joined by Top Chefs Richard Blais and Paul Qui and others where they will do healthy food demonstrations. The White House has distributed 35,000 tickets for the event that will last from 7:30a to 6:20p. 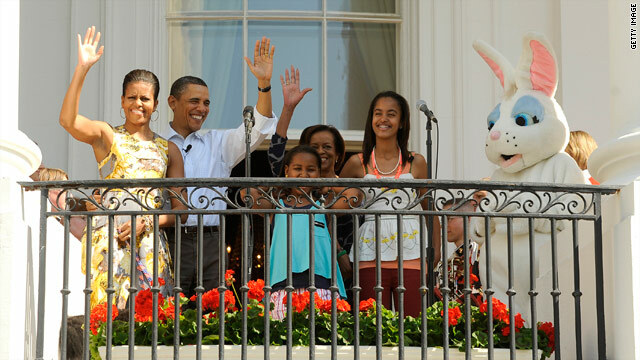 The first family at the 2011 White House Easter Egg Roll. The anticipation is building for some 30,000 kids and their parents for this year's 134th annual rite of spring at the White House: The Easter Egg Roll. Now just one week out and the White House is teasing us with snippets of information. Monday they released the much anticipated list of costumed characters who will be prancing around the White House lawn. There are all the usual suspects like Bugs Bunny, Daffy Duck, Clifford the Big Red Dog and the Cat in the Hat. But they'll be joined by movie characters, Alex the Lion from Madagascar 3 and those Penguins of Madagascar who are described on their website as an "elite strike force with unmatched commando skills." Hmm, the Secret Service might take exception to that! 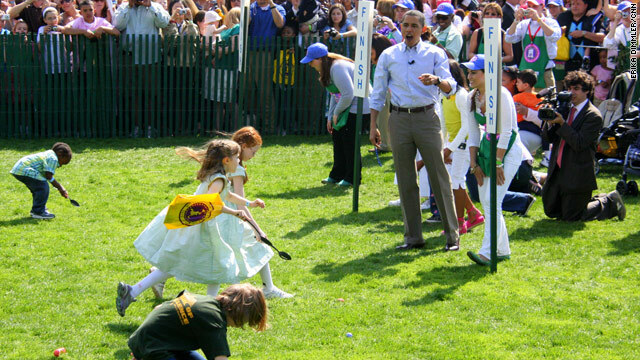 FILE/President Obama cheers on children in last year's White House Easter Egg Roll. 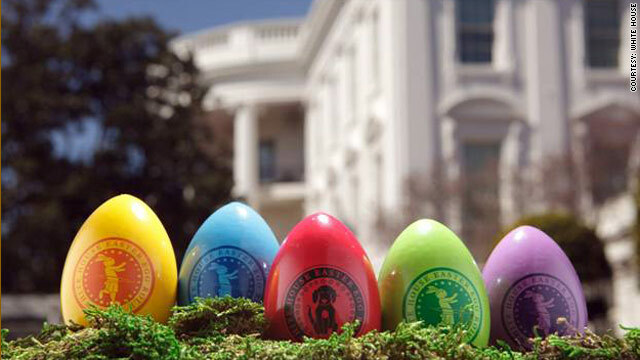 WASHINGTON (CNN) - Next Monday, the White House will host the 133rd Easter Egg Roll on the South Lawn. President Rutherford B. Hayes began the tradition in 1878 by inviting children to roll eggs on the White House lawn after Congress had passed a law banning egg-rolling at the Capitol in 1876. This year 1,200 volunteers will assist the White House in making it possible. Also, 14,500 hard-boiled eggs will be used in the egg roll and the egg hunt and another 4,500 hard-boiled eggs will be decorated by children as part of the festivities.